"Understanding Microeconomics, 14/e, International Edition" reflects current economic conditions, enabling students to apply economic concepts to the world around them. The up-to-date text includes analysis and explanation of measures of economic activity in today's market. It also includes highlights of the recession of 2008-2009, and an in-depth look at the lives and contributions of notable economists. 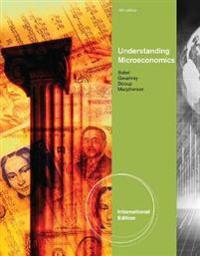 "Understanding Microeconomics, 14/e, International Edition" dispels common economic myths. The text uses the "invisible hand" metaphor to explain economic theory, demonstrating how it works to stimulate the economy. The 14th edition includes a robust set of online multimedia learning tools. Tutorials, analyses and quizzes are designed to support classroom work and increase student performance. A full Aplia course, specifically created for "Understanding Microeconomics, 14/e, International Edition" is also available; visit our associated wesite for a demonstration.